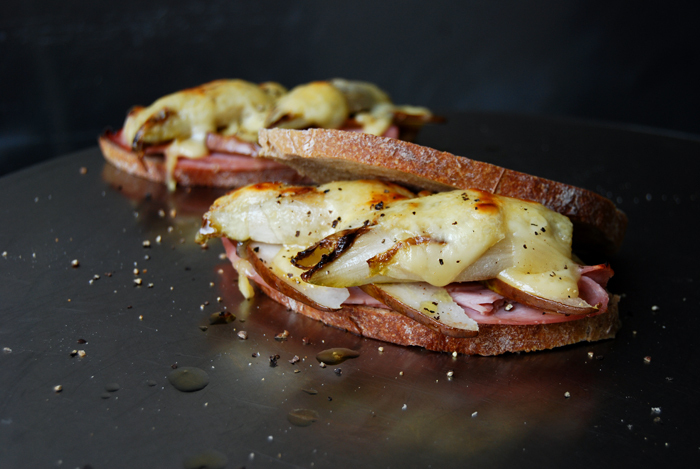 The thought behind this sandwich is simple: 1. 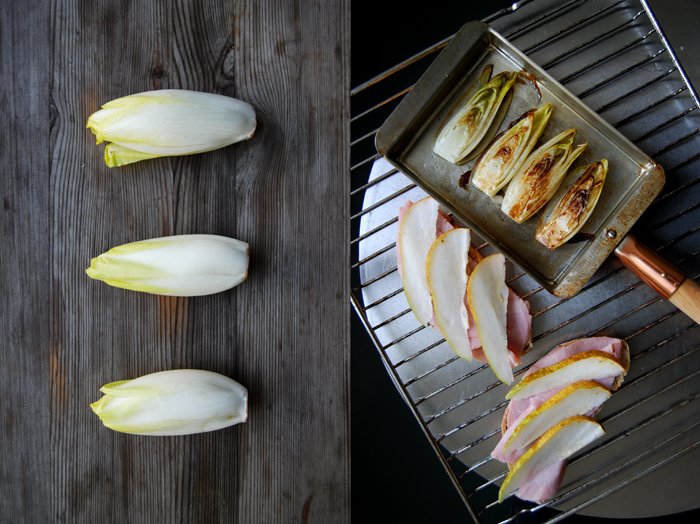 I love the bittersweet combination of endive and pear, 2. the rustic duo of ham and endive gives me a cosy feeling which I desperately crave in February and 3. melted hearty raclette fits to (almost) everything. 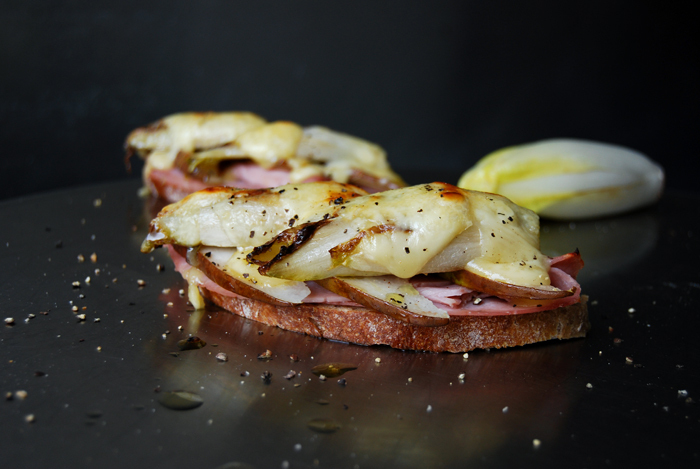 Just the idea of combining these four ingredients in a grilled sandwich sounded so promising that I could barely wait to take the first bite of my new creation. Usually, I’m quite disciplined while I take pictures for my posts but this time I truly suffered behind the camera. It didn’t really help that the smell of this little beauty was even more tempting than its mouthwatering good looks, it was quite a cruel teaser! The result was so pleasing that I quickly prepared a second batch as the first one went down so well. 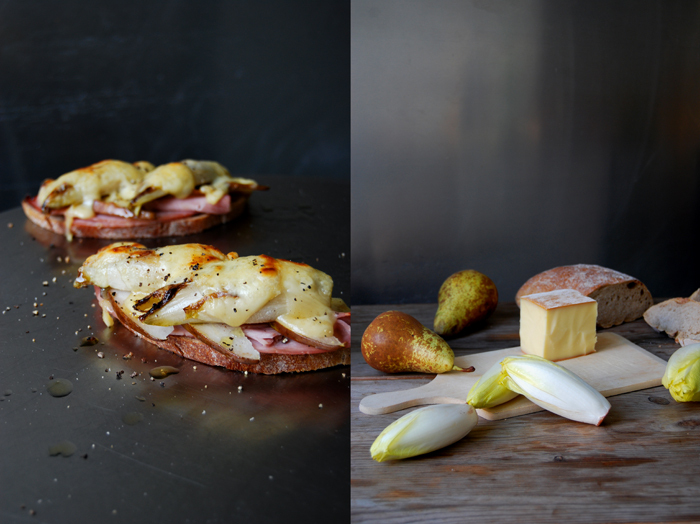 You can use any hard cheese for this sandwich as long as it melts well and tastes strong enough to stand up next to the other ingredients. I can imagine a ripe blue cheese or camembert would be just as good. I’m a big fan of raclette, its powerful aroma is just made to merge with vegetables, meat or pasta. This Swiss cheese is far from being shy without being obtrusive, and it forms these little smoky bubbles under the grill which smell and taste fantastic. 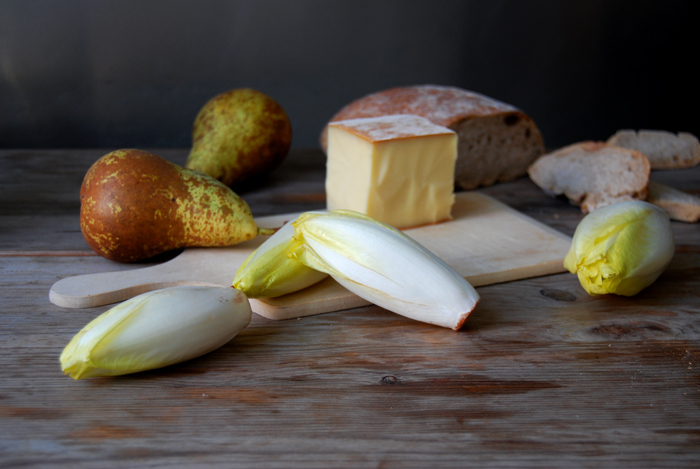 The preparation is quick and easy, I sautéed the endives on both sides before I stacked them on a rustic bun between ham, pear wedges and a generous slice of cheese. Just a few minutes under the grill and the raclette took over my kitchen! 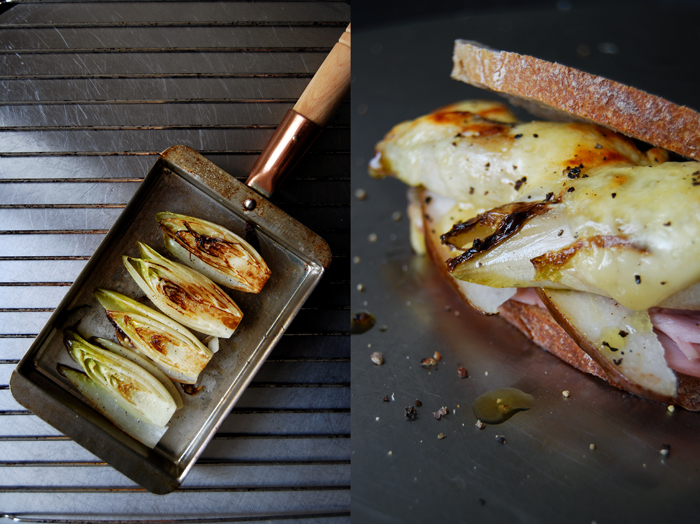 Heat a splash of olive oil in a pan and sauté the endives on medium heat for 1-2 minutes on each side, season with salt and pepper. 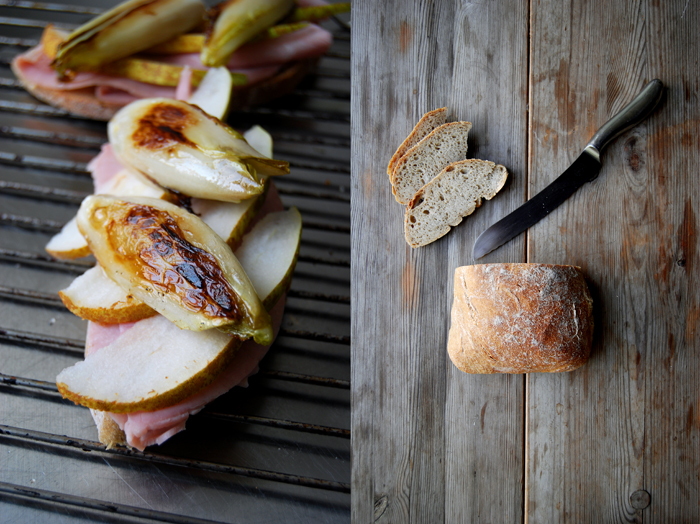 Lay 2 slices of ham on a slice of sourdough bread, spread the pear on top and finish with the sautéed endive. 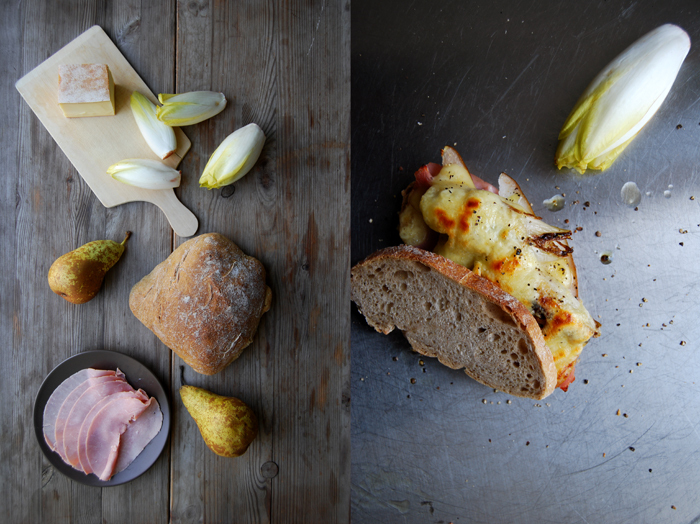 Spread some cheese over the vegetable and continue with the second sandwich. Put both sandwiches under the grill for a few minutes or until the cheese starts bubbling. Sprinkle with pepper and enjoy! before i go on, please let me apologize for bombing your inbox with comments; i am new to this blog and i don’t want to/can’t find a way out of this maze of deliciousness. please do not bother with answering each note aka i do not want to drive you insane.